The Nagaland Government has announced seven-day state mourning from Thursday to August 22 as a mark of respect for former Prime Minister Atal Bihari Vajpayee who passed away on Thursday. In a notification, the government said all government offices, educational institutions, both government and private, will remain closed on Friday as a mark of respect to the departed dignitary. The national flag would be flown at half mast for seven days and there will be no official entertainment during the period of the state mourning, it said. Nagaland Governor P B Acharya, Chief Minister Neiphiu Rio and the Nagaland Pradesh Congress Committee condoled the death of former Prime Minister. In a condolence message, Acharya said the whole nation is deeply saddened to hear the demise of Vajpayee, who was the Prime Minister of India for three times. He was the first non-Congress Indian Prime Minister to serve a full five-year term, the Governor added. “I am fortunate and blessed as party worker to have close contact and had guidance for a long period of 20 years with late Vajpayeeji,” Acharya stated. In his passing away, the nation has lost a statesman, a great human being, a poet, tall leader and above all a patriot, the Governor further said and prayed that the departed soul rest in peace. Rio described Vajpayee as a towering personality of modern India who will be remembered as one of the most popular Prime Ministers of India. 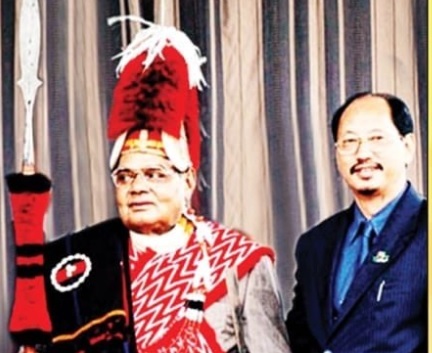 He said the people of Nagaland has special place in their hearts for the former Prime Minister who during his three-day visit to the State in October 2003 made a historic statement in Kohima, which was a defining moment in the relationship between the Nagas and the rest of the country. “Even as we pray to Almighty God to let his soul rest in peace, we rededicate ourselves in carrying out the beliefs and principles of late Vajpayee in our everyday lives,” Rio added. Condoling Vajpayee’s death, the Nagaland Pradesh Congress Committee said the nation has lost a great leader, a gifted orator, poet and a statesman. It prayed for rest of the departed soul in peace.